The Walt Disney Co.'s “The Avengers” grossed $1 billion within the first 20 days it premiered worldwide, further notching the company's place as a leader in the motion picture industry. The news came on the heels of the company announcing that its second quarter earnings were up 21%. Considering Disney (NYSE: DIS) is a dividend paying company, these news events are further reasons that the company is worthy of investment. Furthermore, an expected decrease in capital expenditures should further free up cash for the media giant and allow it to pass along increased dividends to shareholders. Disney pays a dividend of $.60, yielding 1.3%. In January, Disney began paying a dividend that was nearly double what it paid in 2009, which was $.35. 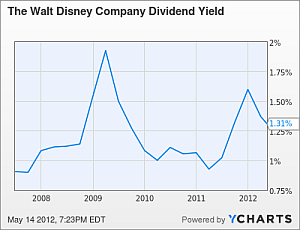 In December 2011, Disney raised the dividend to the current $.60 from $.40. It is speculated that the amount could be further increased this year to $.65. The main reason Disney has been able to increase its dividend payout is due to it spending less on capital expenditures. Having to spend less on projects has led to the amount of its free cash flow increasing. Over the past several years, Disney has been in the midst of funding several projects, including expansions at its parks and resorts. During this time, it saw its free cash flow decrease. For example, for the second quarter of fiscal 2011, the amount was $1.3 billion. For the second quarter of fiscal 2012, the amount had slipped to $335 million, which was a decrease of 75%. However, as evidence that the company's free cash flow is improving, the amount increased 17% for the first six months of fiscal 2012 to $1.4 billion. That compares to $1.2 billion for the same period in fiscal 2011. Capital expenditures increased to $2.1 billion from $1.8 billion during the first six months of fiscal 2012. In addition to expenses related to the expansions of its parks and resorts that are expanding, the company incurred increased expenses from new guest services being offered at Walt Disney World Resort and Disneyland Paris. Disney is building a resort in Shanghai, which is also contributing to the increase in its expenses. At the time of writing, Disney was trading at about $45.56 a share, which was zeroing in on its 52-week trading range of $28.19 and $45.80. That represents an increase of almost 25% since October 2011. When the company announced its second quarter earnings, it reported that revenue increased 6% from last year to $9.6 billion. Revenues for the first six months of Disney's 2012 fiscal year totaled about $20 billion, which was a 3% increase over revenues for the same period in fiscal 2011. Wall Street analysts are expecting Disney's revenues to grow 6.6% in fiscal 2012 and 5.3% in fiscal 2013. 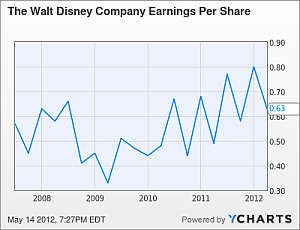 Also noteworthy are Disney's earnings per share, which are also up. For the second quarter of fiscal 2012, they increased 29% to $.63 per share. That compares to $.49 per share for the same quarter of fiscal 2011. For the first six months of fiscal 2012, earnings per share were $1.43 compared to $1.16 for the same period in 2011. Disney's closest competitors are News Corp. (Nasdaq: NWS) and Time Warner (NYSE: TWX). Compared to them, Disney's earnings per share for the year are the largest at $2.79. News Corp.'s earnings per share are $1.34 and Time Warner's are $2.72. Disney's gross margin is 20%, which is lower than News Corp. and Time Warner. Their gross margins are 50% and 34%, respectively. Disney's low gross margin is one of its weakest points. It is to be expected considering the many capital expenses it has completed or is in the midst of completing. I suspect that as it wraps up its larger projects, its gross margin will increase. Disney's other brands are just as impressive, especially ESPN. In fact, Disney credited income growth in its cable division to ESPN. Operating income at its cable networks increased $143 million to $1.5 billion for the quarter.